The celebration of the Easter Vigil is the beginning of the season of Easter. The Vigil is the Christian feast par excellence, the feast of new birth, new beginnings, salvation renewed, and humanity restored to the Lord. While the Vigil marks the end of the paschal fast, the end of the celebration of Holy Week, and the end of repentance and conversion for which Lent prepared the community, it is much more a beginning. It is the beginning of a new season of grace and a time of joy and thanksgiving, for Easter is not one day or one solemnity—it is a fifty day celebration, and the fifty days from Easter Sunday to Pentecost Sunday together comprise what the General Instruction terms "the great Sunday". From apostolic times the feasts of Easter and Pentecost were primary, and the paschal mystery was the first celebration to have both a time before the feast of preparation and a time afterwards for the extension and completing the celebration. 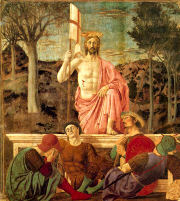 In the new Sacramentary and Lectionary the Sundays following Easter are no longer termed "after" for they are "of" Easter, since they do not follow a solemnity, but they are to be taken as a unity to form one season of solemnity and exaltation at the triumph of Jesus over sin and death. In the former understanding of the season the feast of the Pentecost was set off because it had its own octave. In the reformed calendar this situation is remedied for the solemnity of the Ascension does not end the season of Easter; it is one special day within an entire special season. The Easter candle is no longer extinguished on the Ascension for it should remain in prominence in the sanctuary until Pentecost and then be placed in the baptistry. It can be used at funerals and at the sacraments of baptism and confirmation. The feast of Pentecost now concludes the Easter season and the week between Ascension and Pentecost should be a time of preparation and expectation for the coming of the Spirit. The major principle of the calendar reform called for at the Vatican Council—that the paschal mystery be the center of the Christian year—is made obvious in the new Sacramentary because of the emphasis on Easter as the great feast of fifty days. The Easter candle, lighted for the first time from the new fire of the Easter Vigil, is placed in a prominent place in the sanctuary between Easter and Pentecost and should be lighted for all liturgical services in this season and should be incensed whenever incense is used in the fifty days. The color of the vesture for the season is white, and the cloth or frontal for the altar should be white as well. Liturgical hangings or banners should be made of white and contrasting colors and should reflect the season of new life, fulfillment, rejoicing and joy at the season. All penitential elements in the eucharist should be eliminated in this season of sung Alleluias, water, candles and lights.